Cooler Master has unveiled its upcoming M800 gaming series peripherals at the CES 2018. Among the delights on display were; the MK850 and MK851 Keyboards, the MM830 Mouse, the MP860 RGB Dual Mousepad, and the MH850 Headset. 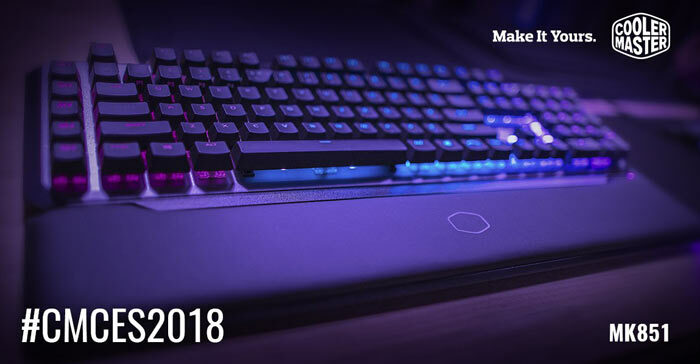 These peripherals are still quite a while away from availability, with launch dates during Q2 and Q3 2018. 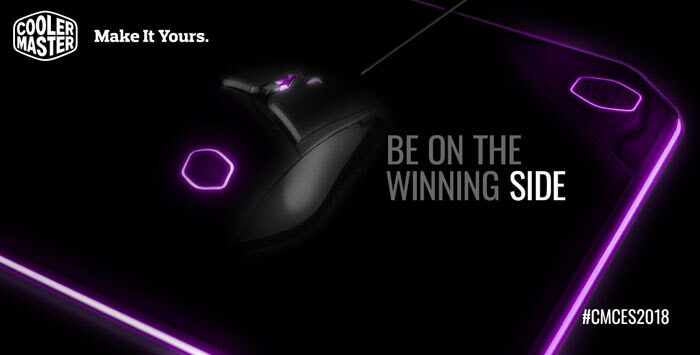 In the meantime you can sign up to be part of the M800 gaming series beta test program. 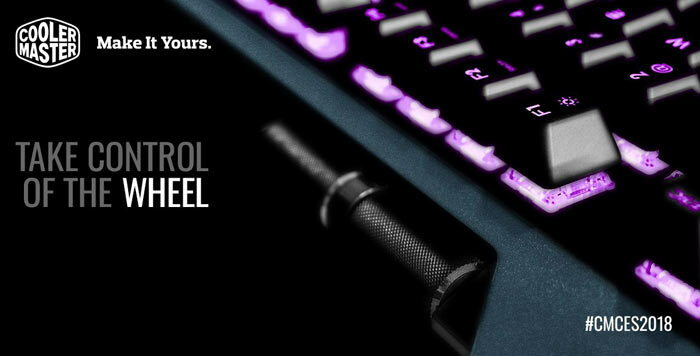 An interesting introduction with the MK851 keyboard from Cooler Master is the full analogue movement control that has been added to a cluster of eight keys, including the WASD keys. Cooler Master dubs this feature 'Aimpad Technology'. As you might expect, the analogue functionality has the potential to deliver smooth precision, especially when driving vehicles, making slight adjustments, or course corrections. Due to the analogue nature of some keys Cooler Master equips the MK851 with linear non-click Cherry MX Red switches. The MK850 shares the all the same features and aggressive design as the MK 851 without Aimpad. It can be supplied with your choice of MX Red or MX Brown switches. Whichever of the M800 series keyboards you choose, there are precision wheels equipped so you can make adjustments of features through a unified software platform. The wheels can function as volume controls, lighting style and intensity adjustments, and other controls. The MM830 features "hidden D-pad technology" with four buttons that can be pressed by rocking your thumb in various directions - without the need to lift your thumb pressure. Cooler Master reckons this is great for MMOs and MOBA style games. The mouse is constructed in a PBT chassis with full 16.7 million RGB options and a 96x94 OLED screen for customisation. It is equipped with a Pixart 3360 sensor with up to 24,000 (adjustable) DPI. Cooler Master's software facilitates programming of the D-pad buttons, precision wheel functions, RGB colour effect adjustments, and more. 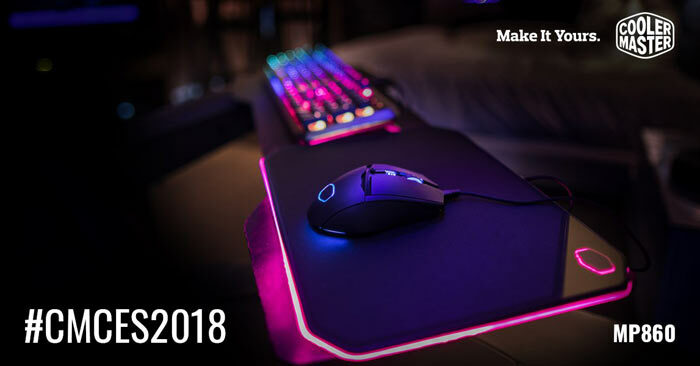 The Cooler Master MP860 RGB Dual Mousepad is so named thanks to its dual-surfaces; there's a hard side for fast, precision gaming, or a soft side for general computing activity. This is a virtual 7.1 headset constructed with cloth and leather for comfort and durability. There are on-ear-cup controls for easy sound adjustments, detachable USB Type-C and 3.5mm cables, a removable flexible boom microphone for convenient positioning, a precision wheel, complete RGB customization, and a fold flat design. 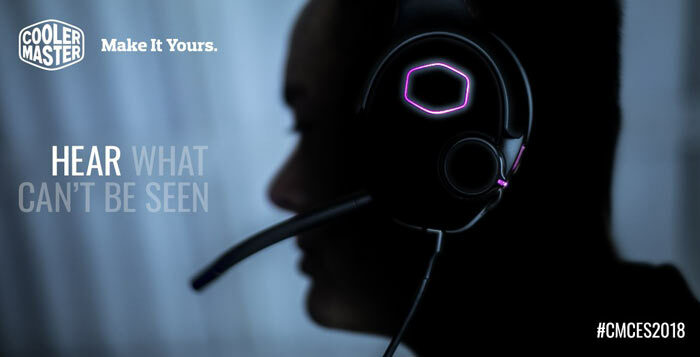 Users can toggle headset 'Focus FX' technology on, to isolate the mid and high tones, enabling them to hear subtle sounds such as footsteps during competitive play. With Focus FX off, the wearer is treated to a lush round sound, great for immersive atmospherics. Saving arguably the best until last, we also took a look at the Cooler Master light-sync technology. Rather than spoil the surprise, watch the video to see it in action, and then do let us know what you think. Cooler Master will also initiate a beta program where users can get their hands on the series and provide feedback.